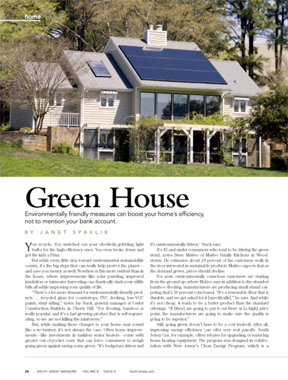 Environmentally friendly measures can boost your home’s efficiency, not to mention your bank account. You recycle. You switched out your electricity-gobbling light bulbs for the high-efficiency ones. You even broke down and got the kids a Prius. But while every little step toward environmental sustainability counts, it’s the big steps that can really help protect the planet – and save you money as well. Nowhere is this more evident than in the home, where improvements like solar paneling, improved insulation or rainwater harvesting can drastically slash your utility bills all while improving your quality of life. But, while making these changes to your home may sound like a no-brainer, it’s not always the case. Often home improvements – like investments in tankless water heaters – come with greater out-of-pocket costs that can force consumers to weigh going green against saving some green, “It’s budgetary driven and it’s environmentally driven,” Stack says. It’s 45-and-under consumers who tend to be driving the green trend, notes Steve Matteo of Matteo Family Kitchens in Woodstown. He estimates about 20 percent of his customers walk in the door interested in sustainable products. Matteo expects that as the demand grows, prices should decline. For now, environmentally conscious customers are starting from the ground up, where Matteo says in addition to the stranded bamboo flooring, manufacturers are producing small-strand carpeting that’s 30 percent corn-based. “It’s a renewable fiber that is durable, and we asked for it [specifically],” he says. And while it’s not cheap, it tends to be a better product than the standard offerings. “If [they] are going to put it out there at [a high] price point, the manufacturers are going to make sure the quality is going to be superior. Still, going green doesn’t have to be a cost tradeoff. After all, improving energy efficiency can offer very real payoffs. South Jersey Gas, for example, offers rebates for upgrading or replacing home heating equipment. The program was designed in collaboration with New Jersey’s Clean Energy Program, which is a statewide initiative that includes financial incentives, programs and services designed to help businesses and individuals conserve. For those considering a home efficiency overhaul, South Jersey Gas offers $125 home assessments that evaluate heating and cooling equipment, insulation, air sealing opportunities, windows and doors, appliances and lighting. The results show where your home is wasting energy, and what steps you can take to increase efficiency and lower your utility bills. The certified contractor who performs the assessment also will help identify a heating system that is right for your home and that qualifies for a rebate. Once the qualified heating system is installed, the homeowner can apply for a $400 rebate from New Jersey Clean Energy and a $900 rebate from South Jersey Gas. Additionally, by making other energy-efficient home upgrades, customers could save up to 30 percent on monthly energy costs. But more than just a one-time rebate, some improvements can yield lasting financial benefits. John Abruzzo of Washington Township has seen his utility bills decrease by about 50 percent since he installed solar panels on his roof. “When we bought our house in 2006, it was about 20 years old, and we knew it was time for a new roof,” says Abruzzo, whose panels were installed but Turnersville-based SolarWorks NJ. An initial site survey of Abruzzo’s house determined that it was a good candidate for solar paneling. Not all homes are, explains SolarWorks chief executive Steve Masapollo. The orientation of the house – the roof must face south – the amount of shading from trees, the structural integrity of the roof and the home-owner’s electricity usage are all factors. In July, New Jersey reached 10,000 solar installations, making it the second-largest user of solar power in the nation, second only to California. In addition to reduced electricity bills, home-owners can look forward to a 30 percent federal tax credit on the installation of a paneling system. Furthermore, home-owners can collect Solar Renewable Energy Credits (SRECs) for the power they produce. While credit amounts vary, Abruzzo said he now receives about eight checks a year for approximately $300 each through his SREC credits. 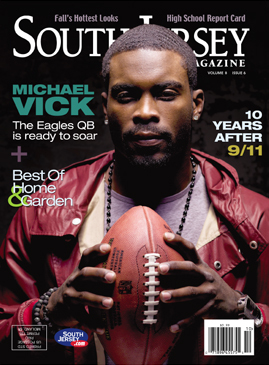 To read the full story visit South Jersey Magazine. 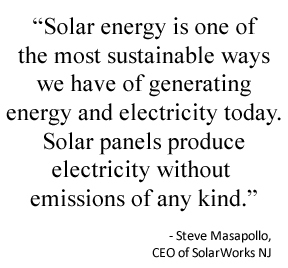 SolarWorks NJ Completes Installation of the Largest Affordable Housing Solar Energy System in Orange, New Jersey. Welcome not warm for solar power in Washington Twp.